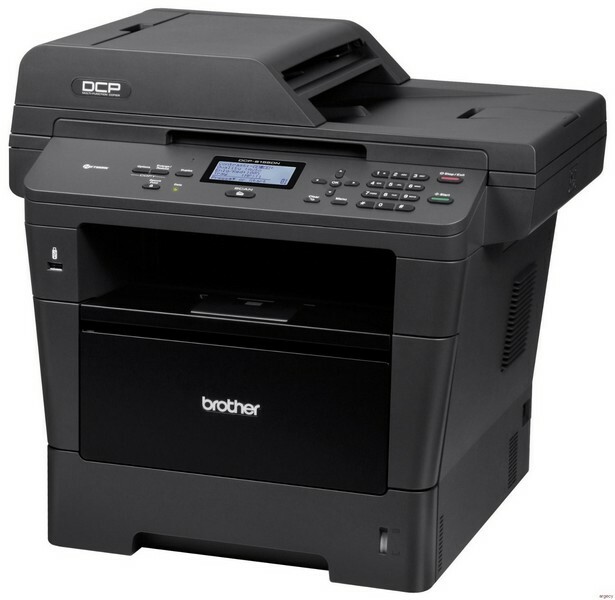 The Brother DCP-8150DN is a cost efficient monochrome laser multi-function copier for your busy office or business. It offers fast, reliable copying and printing up to 40ppm and color scanning in one durable design. Quickly scan or copy multi-page documents via its 50-page capacity auto document feeder or use the legal-size document glass for bound materials. You can share the DCP-8150DN with others on your network via its built-in Ethernet interface or print from your mobile device via: AirPrint, Google Cloud Print, Brother iPrint&Scan, or Cortado Workplace. Plus, it offers automatic duplex (two-sided) printing to help save paper and a 3 year limited warranty (2 year exchange, 1 year depot) for worry free use. Fast, high-quality printing and copying. Produces professional black & white output at impressive print and copy speeds of up to 40 pages per minute. Advanced scanning capabilities. Offers high-quality color scanning and supports a variety of "scan to" functions including: E-mail, file, image, OCR, FTP, USB and Network Folder (CIFS - Windows only). Flexible paper handling. The DCP-8150DN features an adjustable, 250-sheet capacity tray for letter or legal-size paper, plus a 50-sheet capacity multi-purpose tray. An optional 500-sheet capacity paper tray is available for additional capacity. 50-page capacity auto document feeder. Use for unattended copying or scanning of multi-page documents (up to legal size). Advanced security features. This monochrome laser multi-function copier provides a wide-range of security features including: secure print, Secure Function Lock, Enterprise Security (802.1x) and more. Outstanding customer support. The Brother DCP-8150DN offers a 3 year limited warranty (2-year exchange and 1 year depot) with free phone support for the life of your product. Unit Dimensions (W"xD"xH") 19.3" x 16.3" x 17.6"
Carton Dimensions (W"xD"xH") 23.4" x 21.0" x 23.8"
< Unit Weight (lbs) 35.5 lbs. Carton Weight (lbs) 43.7 lbs. For the latest driver updates, visitsolutions.brother.com. Mobile Device Scanning App Requires connection to a wireless network. For more details regarding Brother iPrint&Scan app visit www.brother-usa.com/downloads/printing-app.aspx.